This was another homework assignment that was done for a course I was taking. The requirements are commented in the code for each assignment button. This was more collections, initialization the collections, and iterating thru the collections to display the data. I’m also playing around with encapsulating data in a collection and iterating thru the collection to display the data. You will also see the various classes and object I’m using for the list items. And I’m taking advantage of using a class library on this project for code portability. No live version for this program because there isn’t much to see. You can download the source-code and take a look for yourself. As you can see here not much other than some assignment buttons and a result label. 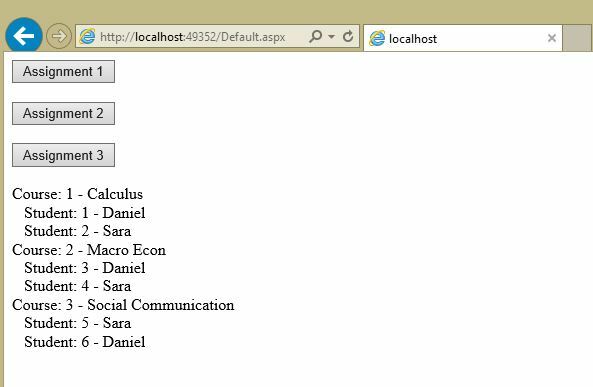 // First course using list and object initialization. // Second course using list and object initialization. // Third course using list and object initialization. // Displaying the results with the help of the HtmlDisplayResult class. * info and the Courses the Student is enrolled in. // Creating the course and student objects. // Create the dictionary list that contains the students and the courses they are enrolled in. * print out each Course they are enrolled in and their grade. // Creating the student objects to be used. // Creating the student objects and encapsulating the enrolled courses and grades. // Creating a dictionary list to hold the student information. button are in the code comments. You will see the object properties in the other classes and the meanings as they’re listed below. The first assigment button is simple. Create a Course object with a Student list, iterate thru, and display the results in some format. The second assigment button I chose to create my Course and Student objects, add them to Dictionary list, iterate thru the list, and display the results. The third assigment button the Course objects were created to be used in Student objects that are being initialized with the Student object properties. Then the Student objects and their values were added to a Dictionary list. Then the list is iterated thru and the data displayed. 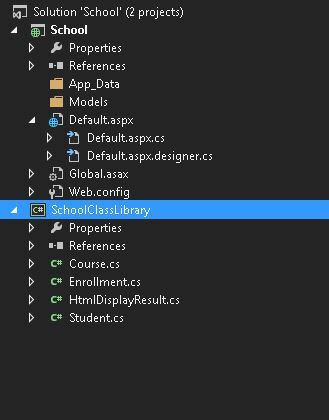 A simple class with the course properties for the ID, Name, and a list of Students with properties from the Student class. Another simple class similar to the Course class. Just some properties for the grade and a Course property object from the Course class. // this has a dependency on one of the other assignment buttons. // the property objects of the Enrollment class. The Student class holds properties for the student ID, Name, List of Courses with properties from the Course class, and a List of Enrollments with properties from the Enrollment class. // Display method for the first assignment button. // Variable to hold the string value of the data being worked on. // Iterating thru the list, pulling out the data, and storing it in the string. // Getting the course information. // Getting the student information. // Display method used for the second assignment button. // Now loop thru the student details to get the courses enrolled in. // Loop thru the dictionary list and pull out the information we need to display. // Loop thru and get the enrolled courses and grades. The HtmlDisplayResult class just formats the information needed and sends it back in a format that can be displayed. list to a generic dictionary list. Then I’m using String.Format() to send the info back for display.